Here is something they don’t warn you about in library school: if you become an elementary school librarian, people will ask you about chapter book recommendations and the only thing you will be able to think of are all the young adult books you’ve read. You will think, “Have I ever read something that is appropriate for a third or fourth grader?” With some thought, happily, I was able to come up with a few. Here’s another thing: “middle grade” really means upper elementary school and the very low end of middle school. I know. Confusing. But I soldier on. 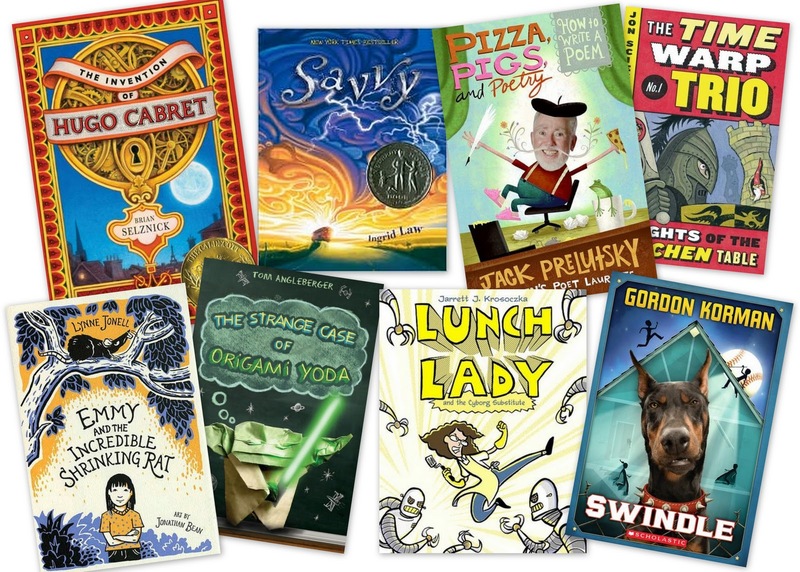 Anyway, here are some of the books I’ve most loved for kids around grades 3 – 6. The Invention of Hugo Cabret by Brian Selznick. This book was wildly popular in my elementary schools because it’s so LONG, but most kids can read it in a couple of hours because the majority of the book is full-page pictures. Plus, the story is great and it’s a movie now (a pretty good one, actually, from what I hear). Savvy by Ingrid Law. This book is just such a fun read. It’s reasonably long, so it’s a good choice for older or more advanced readers. What kid WOULDN’T want to get some magical power on their 13th birthday? (None that I’ve ever met). Pizza, Pigs, and Poetry by Jack Preluzky. I read parts of this one out loud to my 3rd, 4th, and 5th grade classes when we did a poetry unit and they were howling with laughter. Frankly, when I read it myself, I was giggling out loud. I find his poetry even more amusing and kid-friendly than Shel Silverstein. A short, funny read. The Time Warp Trio by Jon Scieszka. I like this series a lot because each book is quite short, but it’s also a high-interest and funny. This is a perfect series for a kid who struggles a little with reading but doesn’t want to be reading “baby” books. Or it’s really a good book for anyone, frankly. Like all Jon Scieszka books, there is a heavy dose of weird. Also a dash of history. Emmy and the Incredible Shrinking Rat by Lynne Jonell and Jonathan Bean. This is still one of my favorite middle-grade books. It’s on the long side (clocking in at over 300 pages), so it’s not probably a great choice for a struggling reader, but if you have a child that just can’t get enough to read, this is a great pick. The Strange Case of the Origami Yoda by Tom Angleberger. This is such a great book for boys. Funny, weird, has great illustrations and a little bit of mystery, plus, it’s just over 100 pages. The nice people at ALA Midwinter in Boston gave me two copies of it and I gave them away as prizes in my library – they were the first two books in a large stack of prize books to go. There is a sequel, too, called Darth Paper Strikes Back. Even the title kills me. Swindle by Gordon Korman. I started off the year reading an excerpt of this to the 4th and 5th grade classes and it never once was on the shelf for the rest of the year. I bought more copies and it still wouldn’t stay in the library. I like this book for its adventure and for the appeal for both girls and boys. A solidly good read. Your lists are amazing. Thank you for the time you spend reading and compiling them. Our son has either read aloud or read on his own 6 out of 8 and they've all been hits. I guess the "problem" with subscribing to your blog is that we read them as you review them and have little left to discover at year-end. We love Everyday Reading and will request or buy books at your recommendation. Yes – read almost all of these. I'll be pointing Tanner to the rest – thanks a million! How are you creating these cute little picture collages? I've tried doing it on Picasa with hair-pulling results…? Thanks for this list. It is so hard to remember books that are appropriate for my youngest reader. She doesn't share the same reading interest as her older siblings so none of the books we've held onto call out to her. I am just eating all of this up. I love your blog, who else is writing about books for middle readers? My son is in 2nd grade but is reading at this level. I am struggling to find books that are at his level but have content is not too mature or scary. Also, your recipes look fabulous too!